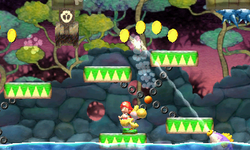 Spray Day Mayday is the fourth level of World 6 found in Yoshi's New Island. Yoshi starts the level in a castle with some enemies and a door which leads to a Checkpoint Ring and a pipe. Here awaits a Whirly Gate which transforms Yoshi into a Submarine which must complete an obstacle course in order to receive a key for the locked door in the room with the pipe. Alternatively, the player can go down another pipe and avoid some Spray Fish to get the key. Inside the locked door is a room with another locked door which must be opened in order to access the boss door. Inside waits Kamek, who must be hit three times in order to proceed.